PARIS—The Breeze-M upper stage of Russia’s Proton heavy-lift rocket on Dec. 9 failed for the third time in 16 months, placing Gazprom Space Systems’ Yamal 402 telecommunications satellite into a too-low orbit, launch-service provider International Launch Services (ILS) and Russia’s Roscosmos space agency said. The launch is all but certain to raise fresh issues over whether Proton Breeze-M manufacturing team has workmanship quality issues that were not addressed by the inquiries into the failures of August 2011 and August 2012. The Dec. 9 failure poses serious problems for Mexican satellite operator Satmex, whose Satmex 8 satellite arrived at the Baikonur Cosmodrome in Kazakhstan, where Proton is launched, on Nov. 29 to prepare for a Dec. 28 launch. The 4,600-kilogram Yamal 402, like many satellites launched solo on the Proton rocket, was fueled to capacity and is likely to provide several years of commercial service despite now having to climb further than planned to reach its operating orbit. How many years of life will be available to it remained unknown in the hours after the launch failure. Roscosmos said Yamal 402, a Spacebus 4000 satellite built by Thales Alenia Space of France and Italy and carrying 46 Ku-band transponders, or 66 when measured in 36-megahertz equivalents, appeared to be in good health in orbit. Moscow-based Gazprom intended to place Yamal 402 into an orbital slot at 55 degrees east. Reston, Va.-based ILS said a Russian government inquiry board would be established, along with an independent ILS board, to investigate what happened. ILS and Roscosmos said initial indications are that the Breeze-M upper stage shut down four minutes early during the last of a planned four burns to carry Yamal 402 into geostationary transfer orbit. The fourth burn was scheduled to last nearly nine minutes. The rocket was intended to place Yamal 402 into an orbit with an apogee of 35,696 kilometers and a perigee of 7,470 kilometers, with the orbit at a nine-degree inclination relative to the equator. The Breeze-M failure released the satellite into a perigee of around 3,100 kilometers, with an inclination of 26 degrees, according to early indications. The failure is the third for Breeze-M since August 2011. All of them have resulted in the destruction or in reduced operating lives for Russian government and Russian commercial telecommunications satellites despite the fact that ILS has launched several non-Russian commercial telecommunications spacecraft during the same period. Industry officials remarked after the August 2012 failure – when two Russian satellites, one for commercial fleet operator Russia Satellite Communications Co. (RSCC), one a commercial telecommunications satellite for Indonesia’s Telkom – that Proton’s recent launch history is disastrous for Russian operators, but not so bad for non-Russian ILS commercial customers. The August 2011 failure caused the loss of a large RSCC-owned satellite. 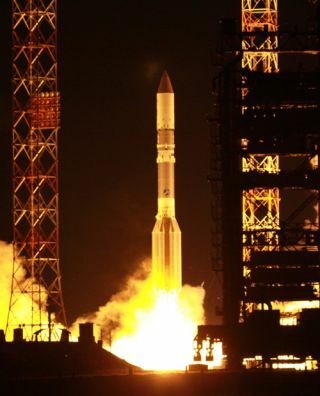 Since its August 2012 failure, ILS and the Proton Breeze-M rocket have launched two Western commercial satellites, for Intelsat of Luxembourg and Washington, and for EchoStar of Englewood, Colo. Both were successful.